Autistic cetologist, transman, furry, and therian! 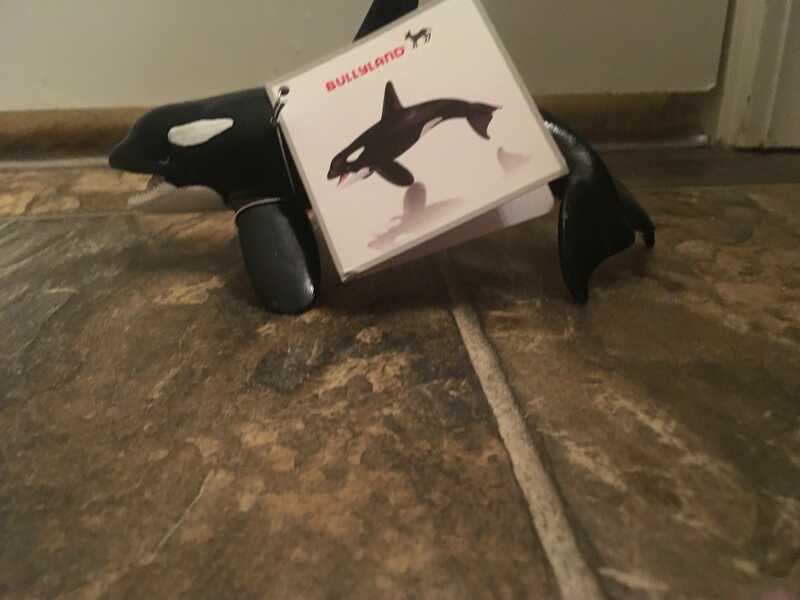 So today I received my bullyland orca in the mail. 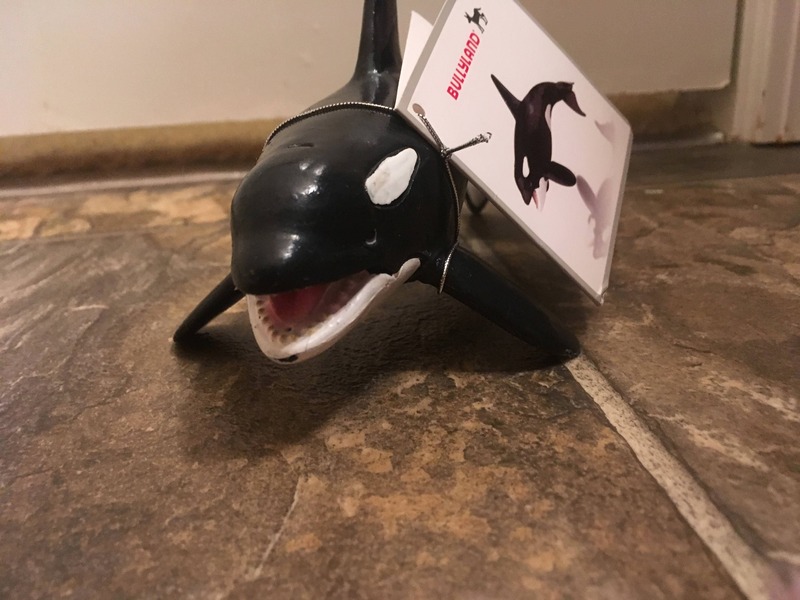 He is one of the last mainstream (Amazon-acquirable) orcas on my list. 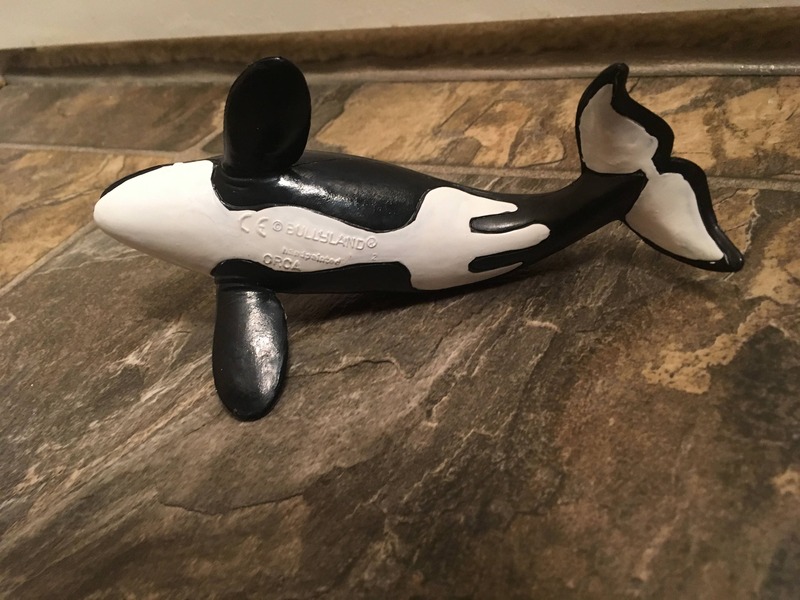 Now I only have the Papo and Phil Seltzer orca to go! 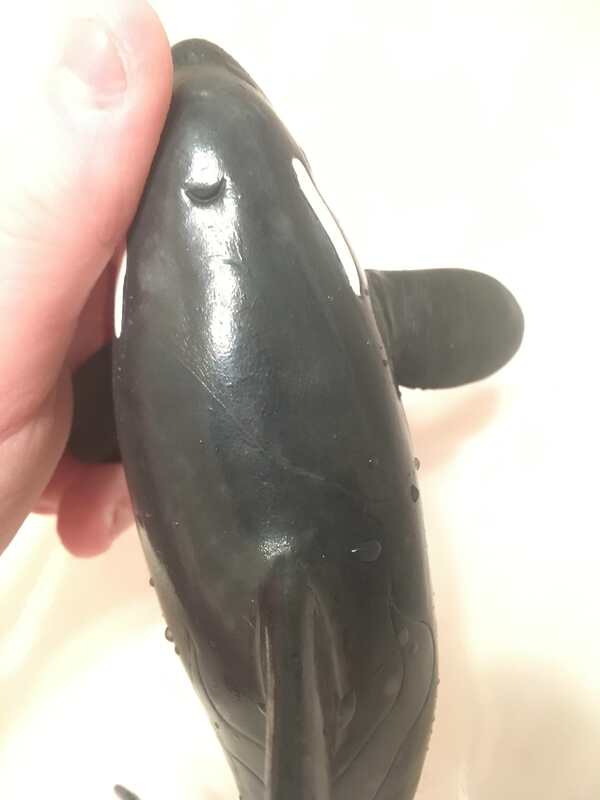 The orca came with the tag wrapped neatly around his pectorals and behind them as well. 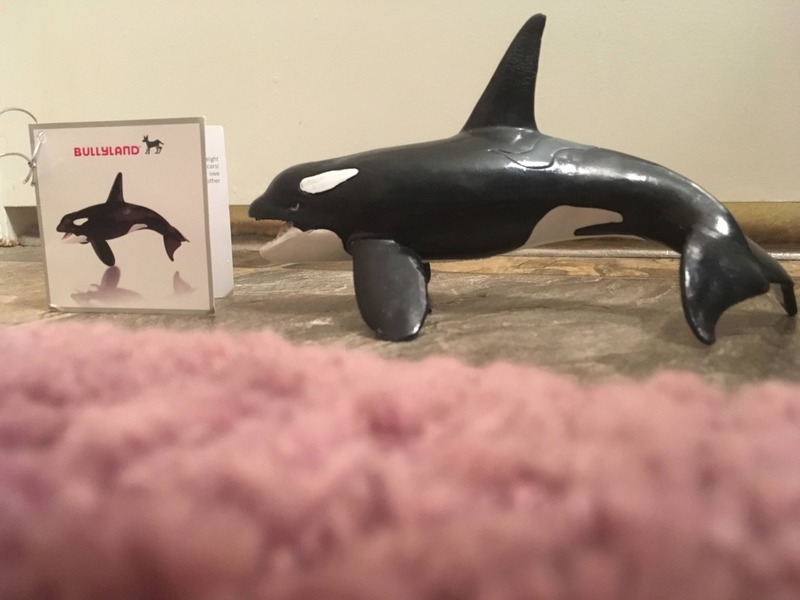 The tag contains some info about orcas, nothing too detailed but would definitely be good for a child looking to learn about them. Here’s the little info packet. 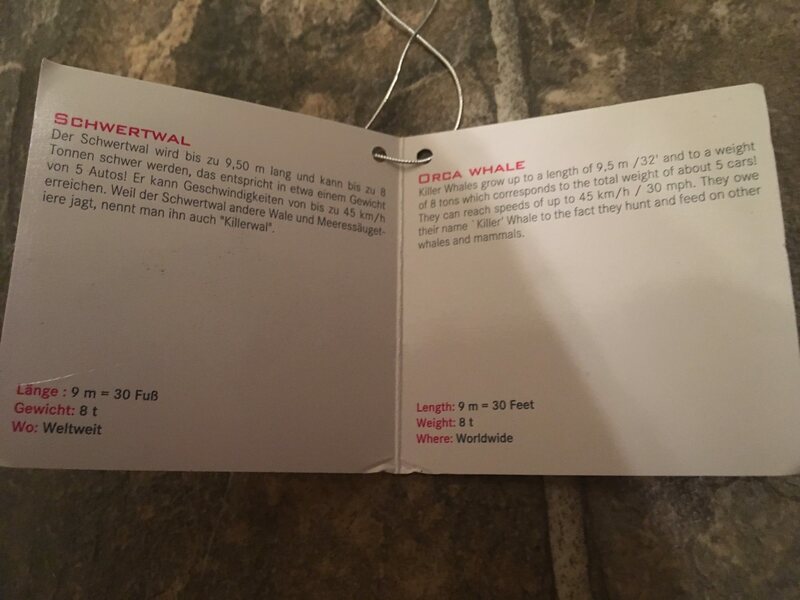 It is printed in German on the left and English on the right. Here’s a comparison of the stock photo versus the actual figure itself. As you can see, there are some differences between the photo and the result- but just like with anything, that should be expected. Here’s the length in inches facing both ways. 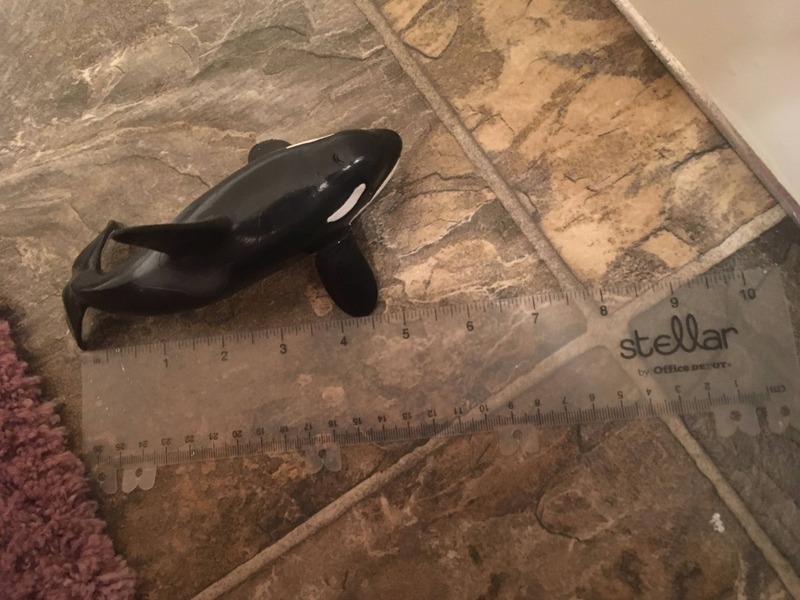 It is around 6 inches. Here is a closeup of his saddle patch. 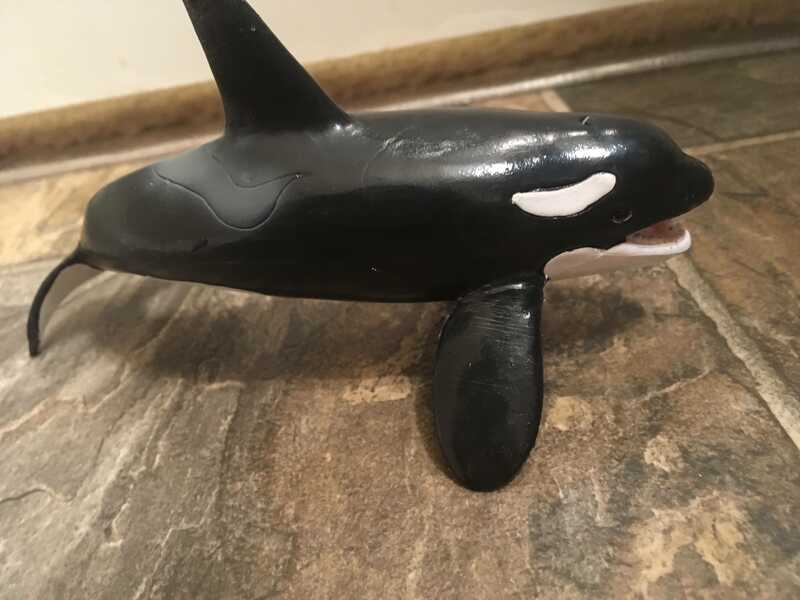 If you know me online or irl, you probably know that I am a big fan of extended saddle patches, which made me happy to see an orca figure with such a unique saddle! Here are his eyepatches and head. The eyepatches are asymmetrical, as to be expected in most figures and in real life. But I feel as though his are far too asymmetrical, as none of them look remotely like the other. 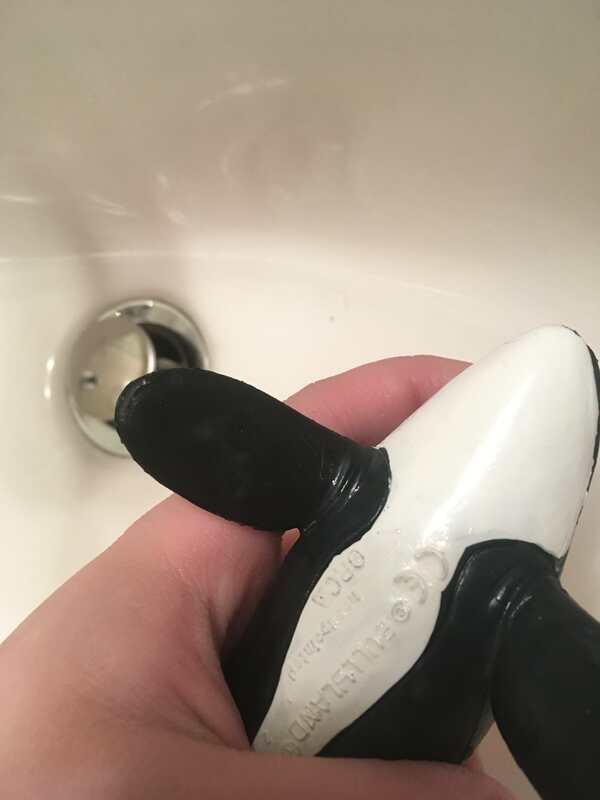 However, it can be excusable as orcas with severely asymmetrical eyepatches have been recorded. 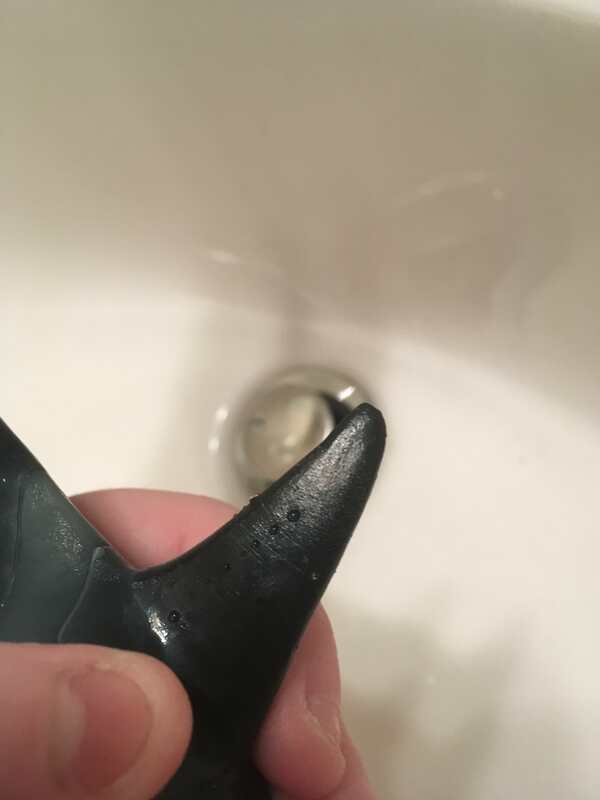 His teeth are sharp and pointy and individually sculpted, painted a light bone color. His tongue is bright pink, really too bright to be realistic. However, it is 3d, which is preferred. 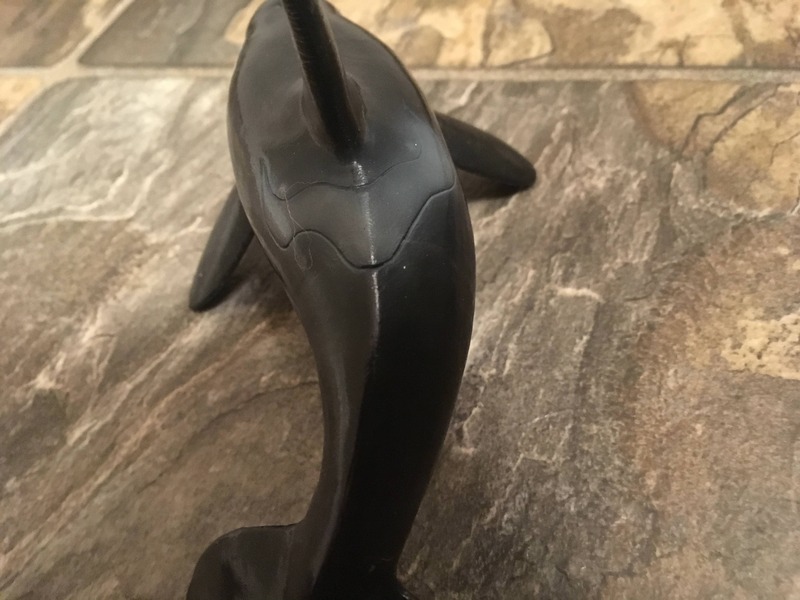 It’s mouth roof is base black and has no detail- a little disappointing. His ventral stripe is relatively accurate! The only problems I have are with the ‘beams’ (I don’t know the actual name of them, but they’re the markings that branch out to the side) and the lack of the spot. The beams are squished and small, when in reality they are large and branch out to the sides. 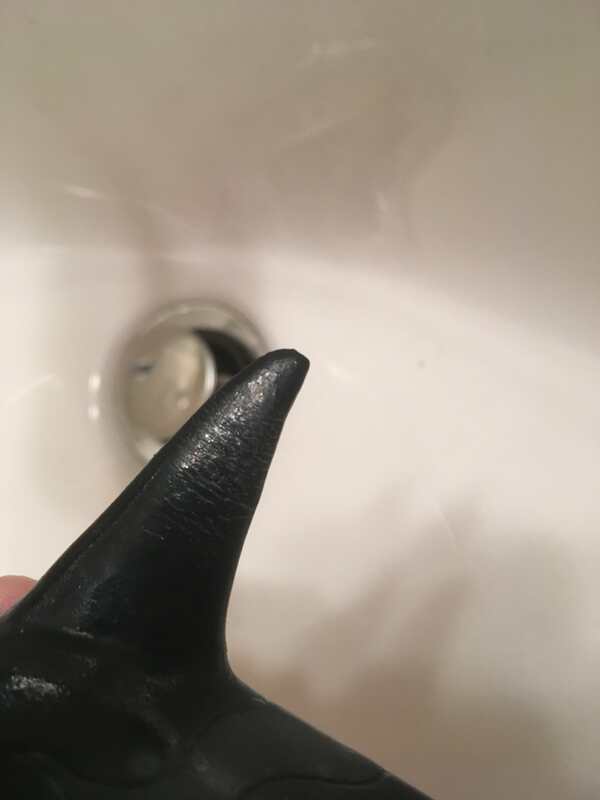 His are visible from the sides, but they are small and squished. However, my biggest qualms are about the material. When submerged in water, the material forms these grey spots, almost like bubbles underneath the initial coating. They do disappear after a while, but it does temporarily give them the appearance of shedding their skin. Another qualm is about the fin. 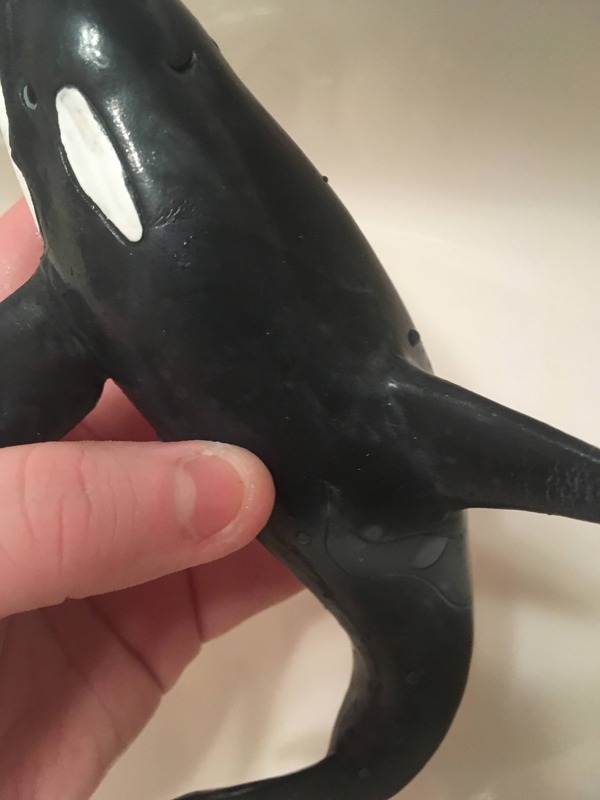 Like the Schleich orca, when the dorsal is bent, it forms wrinkles. 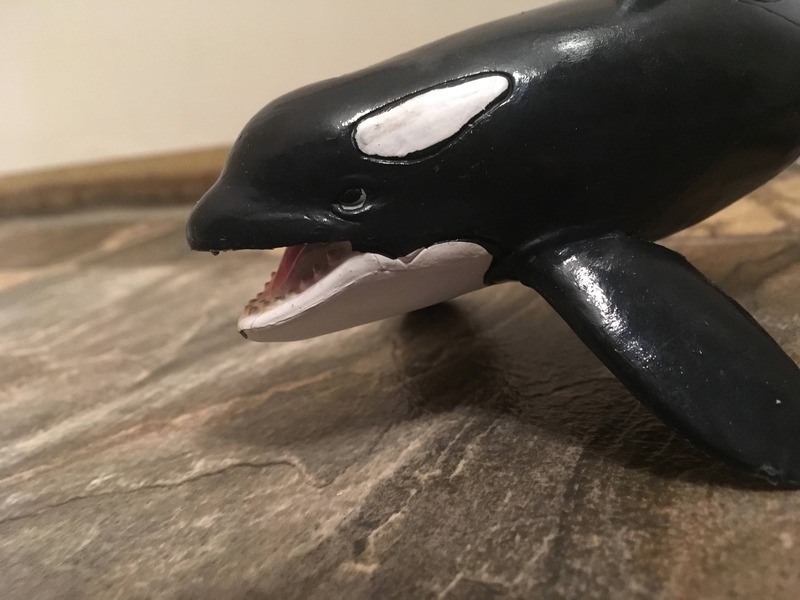 But unlike the Schleich, the crinkles are small and numerous and very rough; also unlike the Schleich, its dorsal crinkled from only slightly being pushed- the Schleich’s becomes crinkly after a full bend. I am hoping it wears off soon as it is rather off-putting and bothersome. 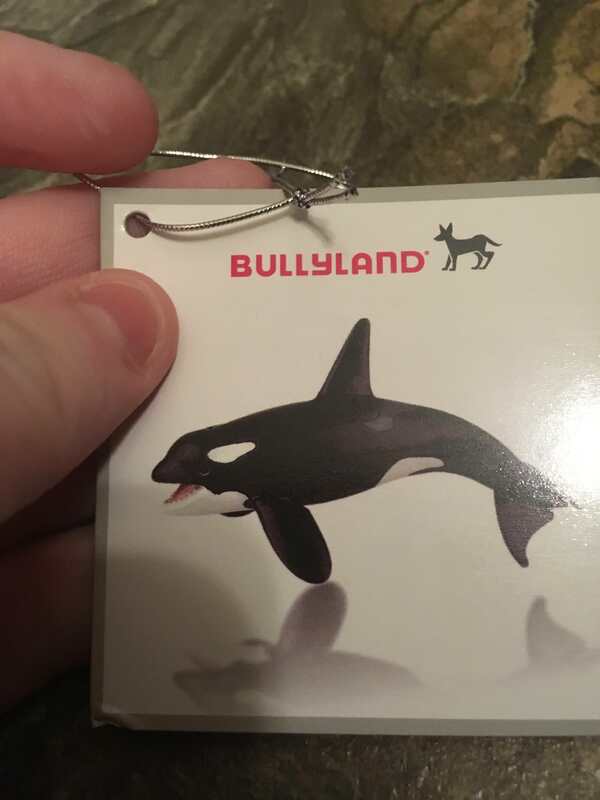 The Bullyland orca is an adorable figure but like the Schleich figure, has an overly massive head and a disproportionate dorsal fin. 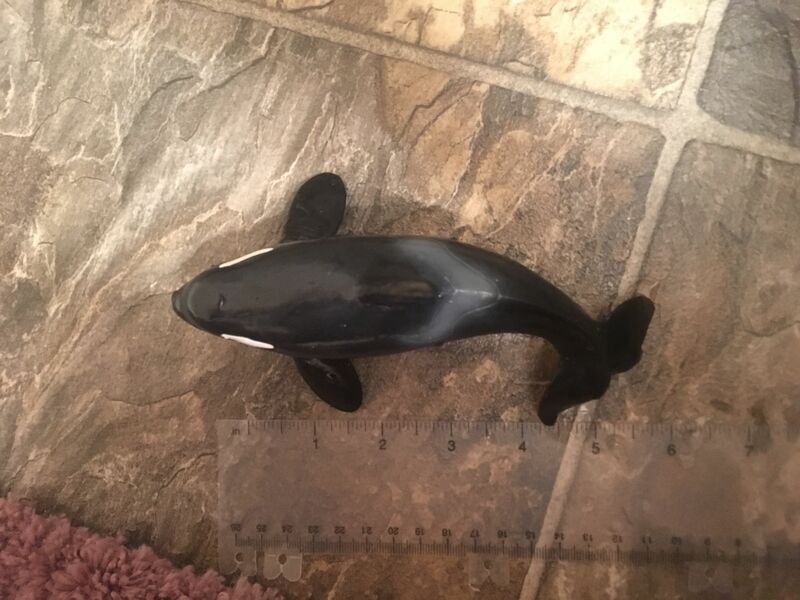 It’s flukes are also too large and too broad, a problem that is common in orca figures. 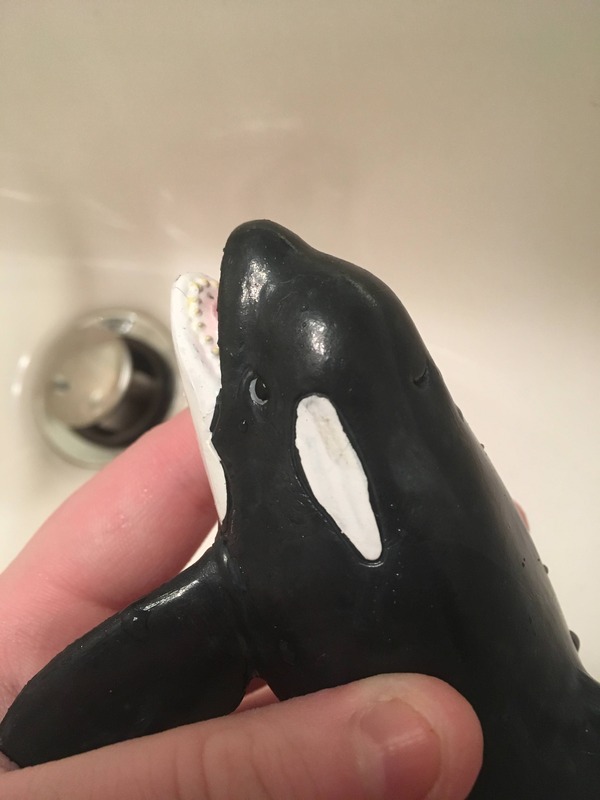 The pectorals are large but like with nearly all orca figures, lack the details they should. However, it does have upsides. I do really like the eyepatches- they are unique, yet simple. The pose is also great and portrays action- it almost looks like it’s changing direction to catch fish or the sort! 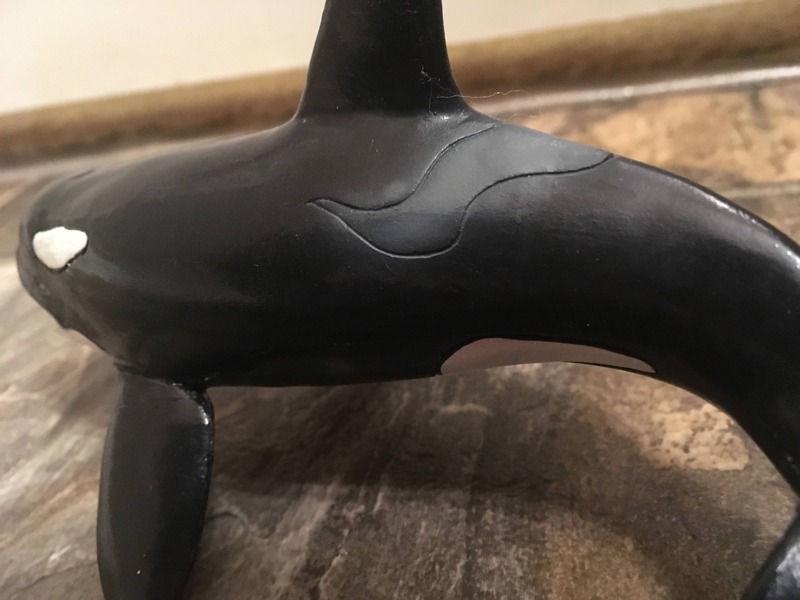 The saddle patch is also beautiful and a very unique pattern I have not seen in a figure before. The ventral markings are accurate and are only lacking the spot. 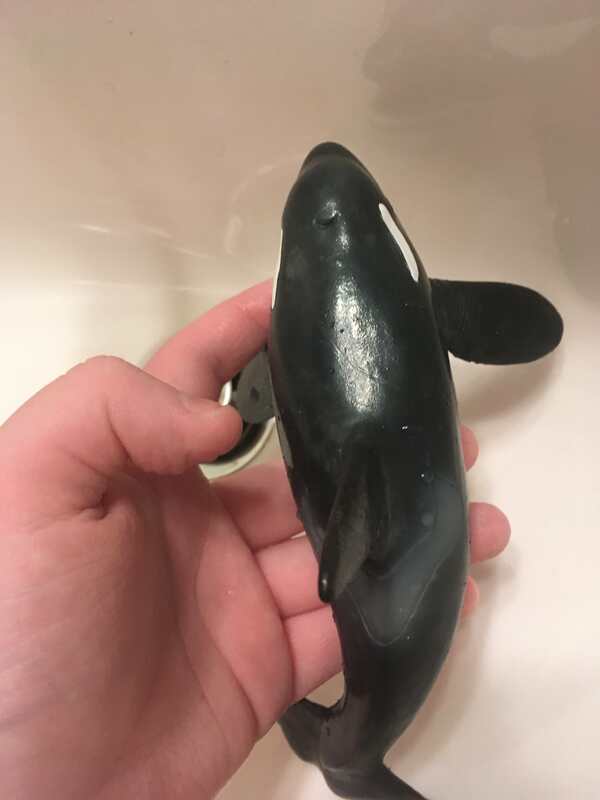 It is also a very buoyant toy! It can fly through the water Betty fast if you aim right enough. Overall, I’ll rate him a 7/10! 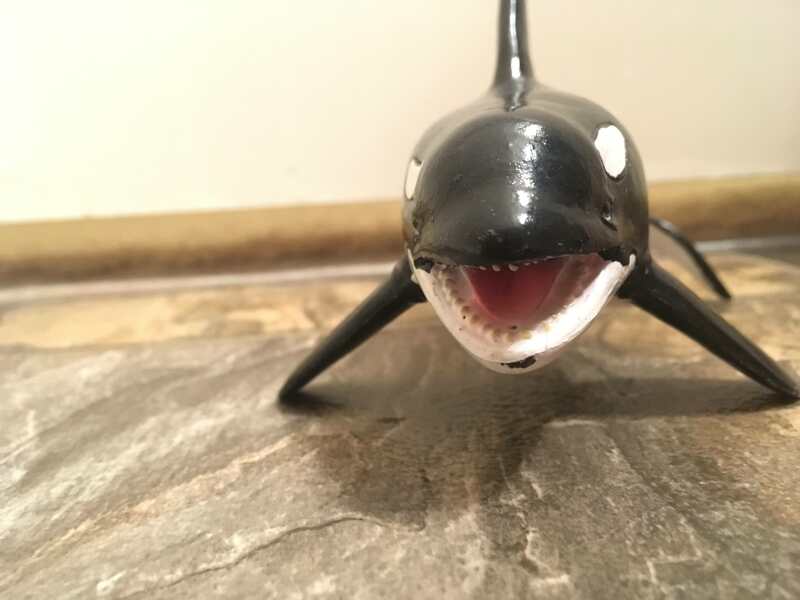 He is a very cute figure and will definitely be added to my collection! Collector of whale figures galore, and soon-to-be collector of dinosaur figures!